Paternuosto is an expert and protagonist of the revival of the beautiful contemporary technique of Encaustic painting. His artistic and cultural interests revolve around the art of ancient Rome and the Roman Empire, Pompeian mural art, and the famous Greco-Egyptian portraits of Fayum. He is considered "the Maestro of Encaustic painting" according to the accredited Italian newspaper: Corriere della Sera. He was defined as "an exceptional artist" by Costanzo Costantini on the Roman newspaper 11 Messaggero, Costantini is an art critic and biographer of: Manzù, Guttuso, De Chirico, Visconti, Fellini, Balthus, Minorai, Mastroianni etc. Again, according to journalist Costantini: "Paternuosto is the most interesting and singular artist I've met in the last ten years who showcases Encaustic paintings of rare preciousness, for the beauty of the figures, the chromatic splendor and stylistic refinement . " He has been mentioned by: the German TV ZDF and RAI, TG3, TLT news and Tele Molise, specialized magazines and Italian and international newspapers: Archeo, Viva Archeology, il Messaggero, Corriere della Sera, BBC History. As well as being mentioned by experts such as Claudio Strinati, Pico Cellini, Umberto Pappalardo, Vittorio Sermonti, L. Ripa of Meana, Mariarosaria Spadaccino Even the great LEONARDO DA VINCI tried his hand at Encaustic painting to outclass his rival MICHELANGELO on the great frescoes for the Palazzo Vecchio of FLORENCE, however LEONARDO probably failed the execution process for Encaustic painting, using braziers instead of the Cauterii. The Cauteri are metal tools required to carry heat on the wax painting. Thus, the work of the Battle of Anghiari is lost and with it so is the SCHOOL OF THE WORLD. Paternuosto is one of the last Italian painters to preserve the most beautiful and complete pictorial technique of all time.. The maestro of encaustic painting skillfuly paints on fresh plaster while it's wet, on marble, wood, paper, canvas and cotto tiles , using colors that are difficult to use on frescos such as: cinnabar, ivory black, vermilion, alizarin, titanium white among others. WORKS EXHIBITED IN MUSEUMS AND PUBLIC SPECES: Portrait of Fayum type. Encaustic on wood 20 x 38 cm. Collection: Guard Financial Control, Sabaudia. Lt. Italy. Emperor, Severus Settimio and family. Encaustic, 70 x 70 cm. Collection: Museum of the, Legion Partica, Albano Rome). Italy. Pompeian decoration. Encaustic 150 x 120 cm. Collection: University Suor Orsola Benincasa, Naples, Fund Amedeo Maiuri Pompei. Italy. The Mythica and Historical Origin of Albano. Encaustic on fresh plaster 150 x 120 cm. Collection: of the Municipality of Albano Rm. Italy. Roman Soldier, Encaustic 20 x 26 cm. on oak wood. Collection: civic Aquino Museum. Fr. Italy. Kàntharos Attico. Encaustic of wood 20 x 20 cm Collection: Museo Nazionale Etrusco di Marzabotto. Bo. Italy. The birth of Rome. Encaustic on fresh plaster, 60 x 80 cm. collection: Civic Museum of Albano Laziale. Rm. Italy. He was born in Toro in Molise, a region of Central Italy. Aged five he discovered Pompeii on a visit to the Villa dei Misteri, in the archaeological excavations of Pompeii his father told him about an ancient painting technique on the mural paintings, he was fascinated on being told the technique was no longer practiced, and he promised his father he would be the one who brings it back to life. His artistic activity began at Campobasso aged fifteen under the wings of two painters from Molise, where his first training took place. In the early 60's he moved to Germany, Paris, Rome, Canada and then finally to Rome, where he currently works in his studio by the Colosseum. In his long artistic career, the maestro mastered various painting techniques, including the fascinating Encaustic painting, along with other ancient techniques, such as Scagliola, producing work of rare artistic quality and beauty. (Scagliola is an art form born in the Renaissance and very uncommon nowadays), Frescoes and art restoration. The maestro's works are present abroad in: Canada, New York, Hong Kong, Sweden, Paris, Hamburg and Italy, primarily in Rome, in museums, churches, aristocratic palaces and homes of famous personalities of Italian politics and art. 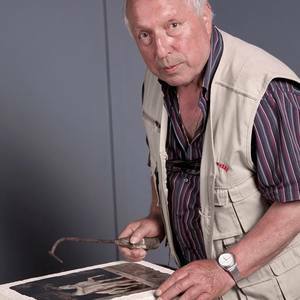 In the early 1970s, his research focused on the pictorial technique of the Encaustic painting, linked to that childhood memory, in Pompeii. In the 1980's he completed his first Encaustic painting and in 1986 he organized his first exhibition in Rome. Several others would follow in: Museum of Roman Civilization, Albano Museum, Colosseum Theater, Aquino Museum, Palazzo Ruspoli. "La pittura a fuoco degli antichi"
Raccontare l’antico: Terra, Acqua e Fuoco. Cura di Michele Paternuosto 5/9/2012-6/1/2013. 2012 Museo Gallery Quirinus, Torggatan11 Kopiing, Svezia.